"Me vs. Fibromyalgia" is a biweekly, one-of-a-kind series designed to give readers and warriors affected by Fibromyalgia a comprehensive look into the facts of the disease and the story of a driven, high-achieving business woman who wouldn't take no for an answer. I've chronicled eight years of experience with Fibro including chronic pain and fatigue, low energy, doctor, relationships and more, and hope to offer answers and support to those who seek them. 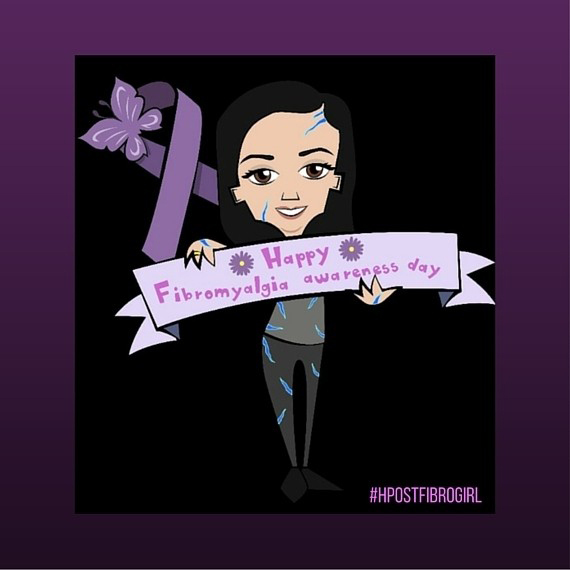 To honor National Fibromyalgia Awareness Day, I've been thinking about what aspects of the condition I could bring awareness to. What don't people already know? The reality of Fibromyalgia is not only that people don't know much about it unless they have it, but there are many who don't even believe the condition is real. In this bonus edition of the Me vs. Fibromyalgia series, I'll be taking my cue from the National Fibromyalgia & Chronic Pain Association's theme this year, "Your Voice Matters." I'm using this platform to voice a few opinions that are rarely spoken but need to be said. It's fake. It's invisible. It's a B.S. excuse for being lazy. Now add in that there's no way to prove what you are feeling is real. Every single test has come back negative. (And you've taken hundreds of tests.) Imagine that amid the fatigue, chronic pain and hypersensitivity, as you try to convince yourself to press on, you overhear people talking about how they are "over your Fibro" and how much you complain about your pain. Imagine hearing that all of your suffering is something you made up in your head. 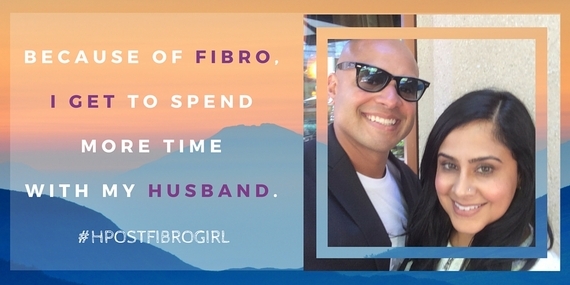 If you know someone with Fibro and want to understand them better, here are 25 Things People Without Fibromyalgia Should Know About People With Fibromyalgia. 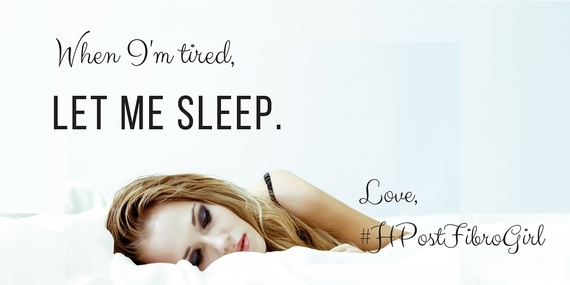 Are you a Fibro warrior? Share this post to spread awareness and understanding. Give gentle hugs please -- my skin hurts. When i'm tired, let me sleep. If i cancel my plans with you, don't be mad -- I already feel bad. If I went out last night, I need a day to recover -- its okay, it was worth it. When I'm in a flare, leave me alone in a dark room (but check in). It makes me feel good. 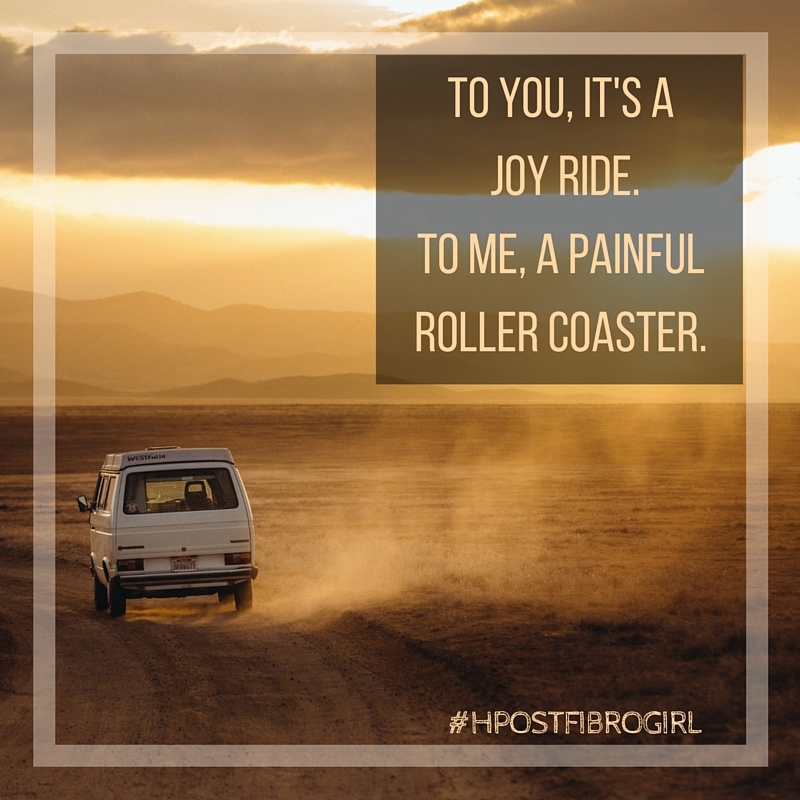 Your friend with Fibro who that has no pain doesn't make me feel any better. "You should exercise." My work day is my exercise. I play hide and go seek with the elements -- too cold, too rainy, too hot, too much sun. To you, car rides are joy rides. To me, they're a painful roller coaster ride. Going to the doctor makes me mad -- it's a reminder of my condition. Some days it's OK to let my Fibro win. It reminds me that this is a marathon, not a sprint. I can get moody, you would be too if you were in pain all the time, be patient with me. 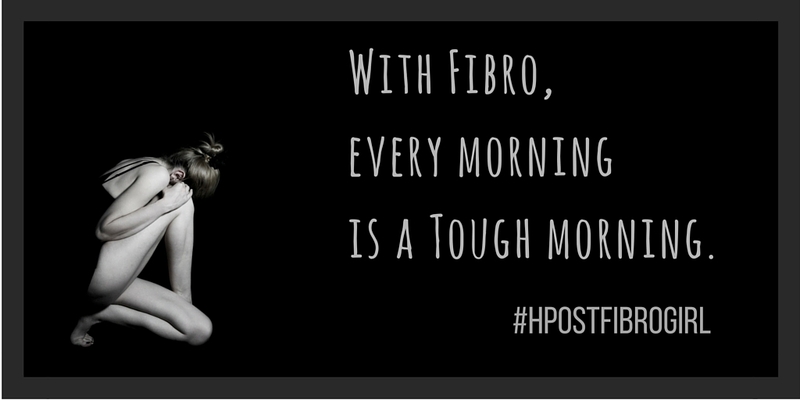 Because of Fibro, the mandated downtime gives me the opportunity to write this blog, and I'm grateful. Because of Fibro, I've become part of a strong, supportive community that reminds me I'm never alone. 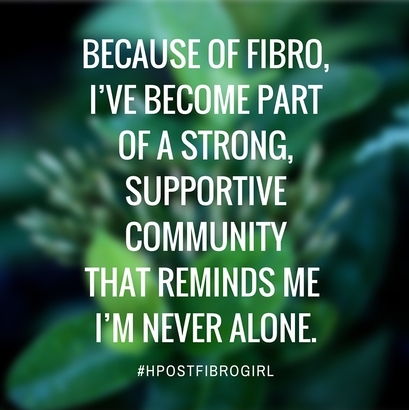 To become part of a community that is making a real difference, join The National Fibromyalgia Association's facebook page here. For a wealth of information about Fibro, here are Healthline's "Best Fibro Blogs of 2016." Still to come and next up: Me vs. Fibromyalgia: Part 4 -- Flare Up, Now What? ?